Keeping your body square helps you land evenly on the balls of your feet. Sprinters work out their calves when they run properly on the balls of their feet, and defined calves look great in a pair of heels. The quick cadence and speed needed throughout a quick race require that a runner's feet make contact with the ground for as brief a time as possible. In order to do this, sprinters will run on the balls of their feet. 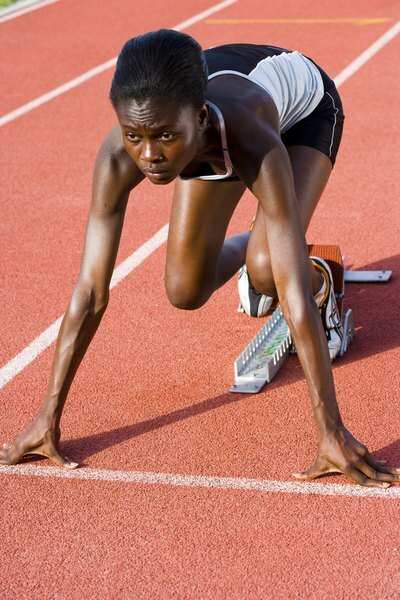 Running on your heels or toes for sprinting is not only ineffective, but it can also lead to injury. In sprinting, the toes should only be used for balance and direction. The balls of your feet will help spring you forward. Landing on your heels not only causes unnecessary stress on your joints, but it also slows your stride, according to running coach Rick Morris. Sprinting on the balls of your feet creates optimal alignment for using your calves and quadriceps for power and forward thrust. Arms should be loosely held at right angles and driven back at the elbow as far as possible. Shoulders should be square and relaxed. While sprinting is a powerful activity, breathing correctly and relaxing into correct form will help your speed and balance. When the foot comes toward the ground, lift the toes up toward the shin so your foot is horizontal. A slight forward lean with the balls of your feet landing directly under your center of gravity is proper form throughout the sprint. Plyometrics are anaerobic activities that help with explosive power and speed. Sprinters use plyometric drills to quicken their cadence. Landing on the balls of your feet during plyometrics allows for the quickest reaction time and most effective alignment for springing upward or forward. To begin a box jump start with a wide stance and slowly lower yourself into a squat. Once you're in the correct position, spring yourself up to full extension. Land on the box without touching your heels to the surface and bound back down to the ground landing as if you were landing into a pair of high heels. Repeat this movement for 10 reps.
Stretching before and after your workout lowers your risk of injury and helps your muscles recover. When you sprint on the balls of your feet, you isolate your calf muscles. Stretching your calves thoroughly helps prevent cramping or strains. Dynamic stretching is more effective than static stretching before doing workouts that require speed and power. To dynamically stretch your calf muscle, get into a pushup position and bend upward at the waist. Keep both feet flat on the ground. Slowly lift one heel and stretch the opposite calf past the mild tension zone. Hold for one to two seconds and then switch legs. Repeat 10 times for each calf. Stretching after your workout helps recovery and static stretching helps release lactic acid and relax muscles. Perform the static version of the previous stretch. To begin, get into a pushup position and bend upward at the midsection. Slowly lift one heel off the ground and relax that leg. You will feel tightening in the opposing calf. Hold in the mild tension zone for 15 to 30 seconds and then switch legs. Repeat until your calves feel warm and loose. Running Planet: Toe, Ball or Heel - Where is Your Foot Strike?